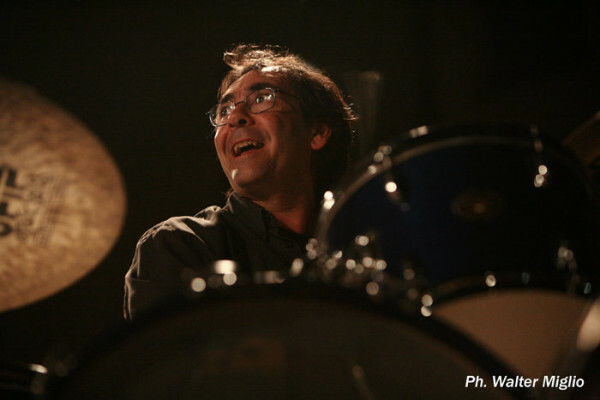 He starts his musical studies in the field of the jazz’s schools of Milan’s area, attending the drums’ courses run by Enrico Lucchini, Giancarlo Pillot and Carlo Sola. Afterwards, he is one of Roger Robertson’s students and he takes part in a period of training with Elvin Jones and Paul Motian. In the United States he studies with Skip Hadden at the “Berklee College of music” of Boston. In 1985 he starts a long cooperation with Gunter Sommer and he participates in concerts and tours all around Europe. He has worked together with a number of musicians, among whom Paolo Fresu, Gianluigi Trovesi, Tony Scott, Garrison Fewell, Bob Muver, Furio Di Castri, Donovan Mixon, Mario Arcari, Gabriele Mirabassi, Michel Godard, Attilio Zanchi, Gunter Sommer…and he has taken part in a lot of important festivals in Italy (Umbria Jazz, Clusone Jazz, Monza, Como,…) and abroad (Europe Jazz Festival du Mans, Lyon, Paris, Berlin, Leipzig, Dresda, Stuttgard, Tel Aviv, Croatia, Switzerland, Slovenia, Japan…). He has cooperated with the “Pomeriggi musicali”’s orchestra of Milan, with the rhythmic and symphony orchestras of the RAI and he has also joined in some television productions. Parallely to the jazz’s activity, he completes the classical studies in the music’s Conservatory “G. Verdi” in Milan (Como’s seat), where he gets the diploma of Percussion Instruments, studying with F. Campioni, M. Ben Omar, W. Morelli and G. Sciuto. He even takes part in a number of performances in the field of contemporary music and, with the group “Naqqara”, he wins the international contest of Stresa and the national one for percussionists of Bovino (Bari). He takes the diploma of the jazz’s course of the Conservatory “A. Boito” in Parma studying with T Lama, P. Leveratto and F. Di Castri. He faces the problems of the musical education and he develops courses aimed at the musical practice and directed to several age brackets. He conducts a laboratory of rhythmic animation that leads him to carry out with the students the CD “Per volerti raccontare”; he holds stages and laboratories in several school’s fields. In parallel to the teaching activity he carries on the concert one in Italy and abroad, with some steady groups as “Aliffi – D’Auria quartet”, Gabriele Mirabassi and as a session man.